Approximately a hundred people showed up at the Spring Garden Road Public Library on Thursday, June 20th to show their support for the people of Brazil. Singing the national anthem of Brazil and cloaked in the countries national colours, green and yellow, demonstrators hoped to raise awareness of the living conditions citizens are subject to in their home country of Brazil. The initial protests in Brazil were triggered by increased transit prices. One of the event organizers Igor Santos, who grew up in Rio de Janeiro, explained that the recent transit hike was merely "the straw that broke the camel's back" and that there are much deeper roots to explain the civil unrest in Brazil. Brazil is currently hosting FIFA's confederation cup. The country is also slated to host FIFA's World Cup in 2014 and the 2016 summer Olympics. In preparation for the hosting events on the world stage, spending on stadium upgrades has spiralled out of control to reach over $30 billion. When the cost of hosting the Olympics is factored in, these sporting events may well end up costing as much as $60 billion. However, the final costs are not yet known. Many believe that there are better ways for Brazil to spend its money. Brazil has an exceptionally high illiteracy rate, overcrowding in hospitals, and extreme poverty. Olympics-related spending on stadium and infrastructure upgrades, marketing, and airport improvements do little to benefit the working class people of Brazil. In fact, accommodating the Olympics has already displaced people from their homes in the favelas. Many residents have either been evicted or offered monetary compensation for the destruction of their homes in order to make room for tourists during the World Cup and the Olympics. 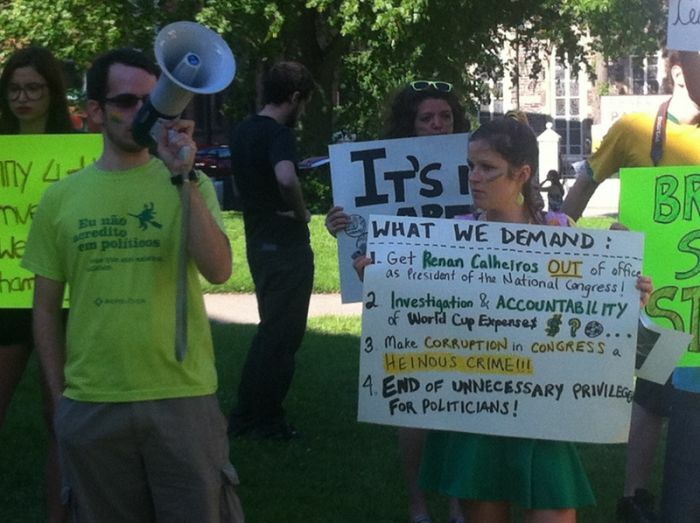 Political corruption remains a root cause of the protests as well. 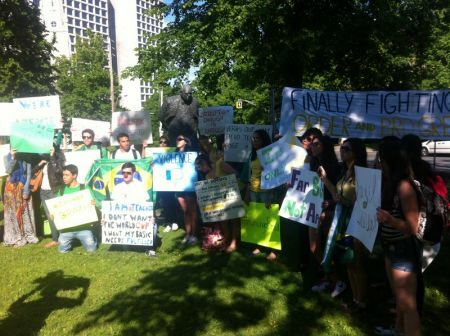 The demonstrators in Halifax point out that Brazil is more than the pristine beaches and massive soccer games that western tourists see. Hidden behind the wall of tourist resorts are the favelas, which are slums built in the mountains and often lacking basic amenities such as running water or electricity. Many of the favelas are controlled by drug cartels causing serious security issues for residents. The Brazilian government is attempting to regain control of the favellas before hosting the World Cup and the Olympics. "They go to the favelas, take people out, they try to claim the favelas from the criminals but it is not all the hills that are being taken, it's just those that are important" says Santos. Many expect the criminals to return to the favelas after the World Cup and the Olympics are over. To this date there are also no plans for how the stadiums used in the World Cup and the Olympics will be maintained after these events. Protests in Brazil began as small demonstrations which were met with excessive police force transforming the peaceful actions into full blown riots. Civil unrest has spread throughout Brazil culminating in over one million protestors taking to the streets of Brazil on June 20th. Daniel Santos who grew up in Recife, Brazil and is now studying computer science at Dalhousie University explained the difference between residing in Canada and Brazil noting that "here life is so much easier, calmer, safer. I'm lucky because I came from a good family but a lot of people don't have the same chance that I did." "We are here to raise awareness in cities around the world. 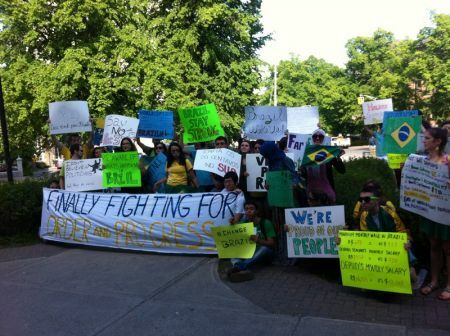 There are protests happening in Toronto, Ottawa, New York, Berlin, Australia, everywhere Brazilians are giving support for what's happening in our country" said Igor Santos.